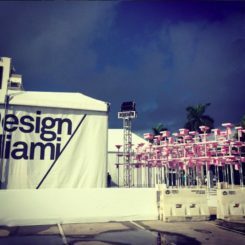 Early December means that Miami becomes a mecca for design and art lovers, as the city is host to , Art Basel and dozens of other art and design events. 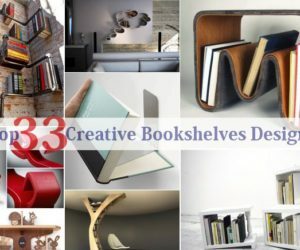 Shumatsu Distortion was there for all of the exciting events, checking out the latest designs for your home and innovative, creative art to enhance your life. 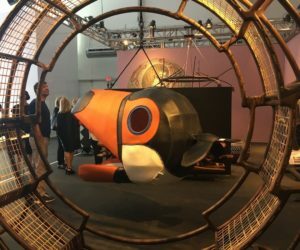 First up on our agenda was Design Miami, which is a carefully created show of both modern and contemporary design right alongside vintage pieces – some well known and others not so much. The eclectic array from galleries and designers around the world makes for fascinating browsing and exciting discoveries. The sleek and masterfully crafted wood is refined and elegant. 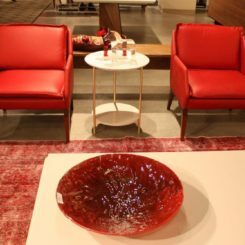 The gallery specializes in 20th century Nordic design along with contemporary artists and designers. 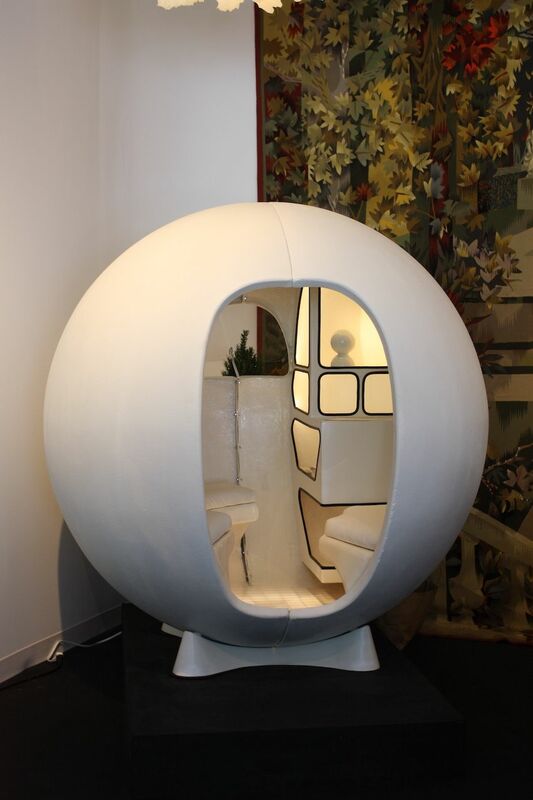 Maison Gerard’s Vidili Sphere is one of the few that still exist. This curio is a wonderful display of Norwegian female artisans. The artist’s technique comes from his interest in Meissen porcelain. The predominantly green and blue fixture is accented with piece in an eggplant shade. 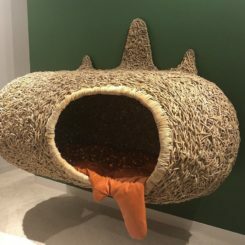 Hefer’s creations are as much a touch of whimsy as a piece of usable furniture. Kahn’s pieces are pure fun and the ultimate in imaginative creativity. 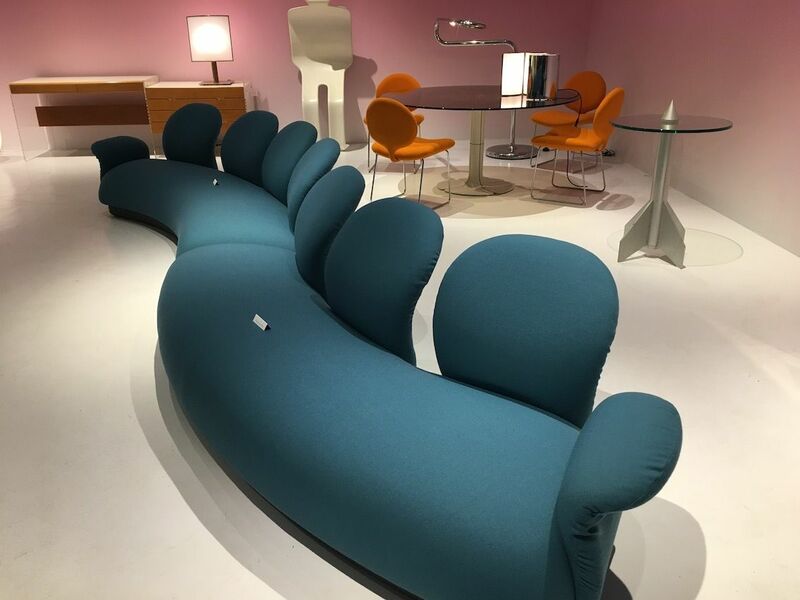 Demisch Danant, which regularly presents spectacular sofa designs, featured this Pierre Paulin F280 Series that was originally conceived for public spaces in around 1969-70. The long and winding design is upholstered in a wonderful teal fabric. The seats along the side are like large petals growing out from the seat. 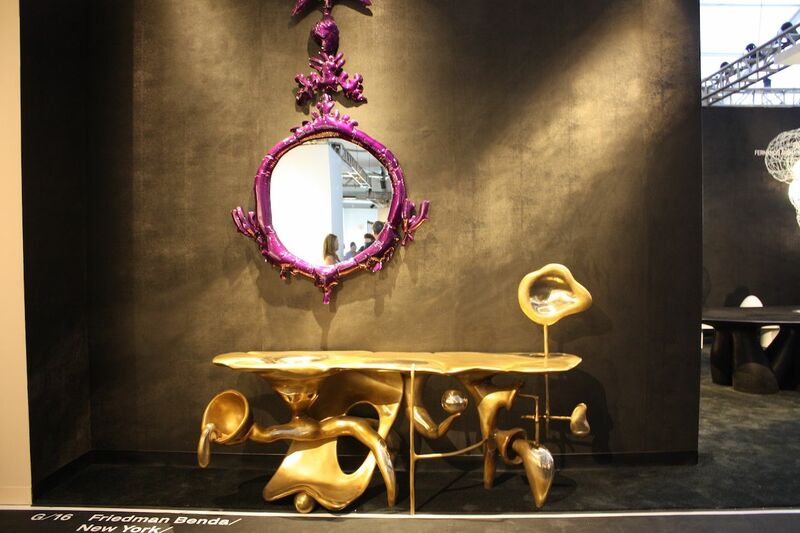 Converso is a leading dealer of modern furnishings and objects, including rare prototypes and limited editions. 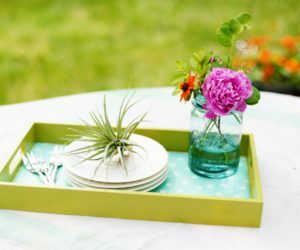 This modern arrangement was presented by . 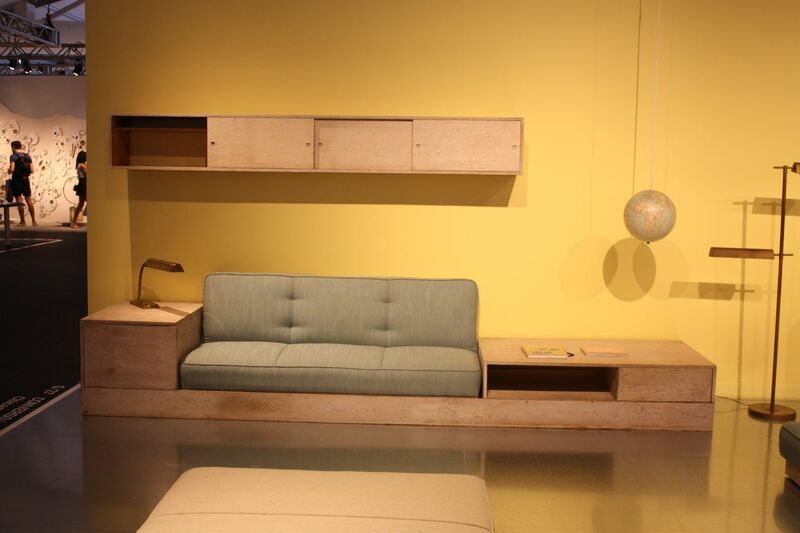 The set is by Swiss architect Albert Frey, who designed them in 1949 for his home in Palm Springs. Frey designed minimalist residences for the California desert that blend into the surrounding landscape. The set strikes us as a blank slate for your own ideas and a place to think. 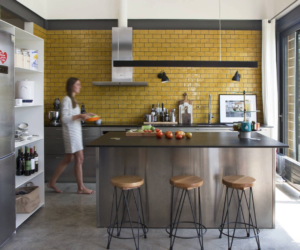 Demisch Danant focuses on twentieth century French design. For the show, created an arrangement called WELCOME!. 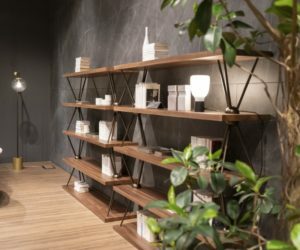 The concept focuses on an open environment and on exemplifying “good living.” The booth feature furniture by furnishings designed by Italian designer Chiara Andreatti. 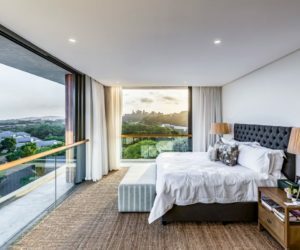 A combination of natural materials and luxurious design, the space is accessorized with topical plants. The sum total is an elegant and refined space that is still very inviting and comfortable. Andreatti’s design also pays homage to iconic elements of the brand, including Cuoio Romano, Punto Selleria, Lace Up, Pequin. Andreatti’s skill in combining Venetian craft with superb design is evident in the elements and layout of the room. This massive beauty is by Israeli designer and and is part of his Pebble Series. 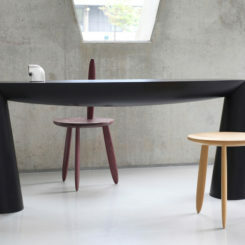 The sleek table features woods that he chooses and arranges to emphasize differences. The top of the table and the legs are all composed of light and dark wood in a multidirectional pattern that highlights the contrasts and gorgeous wood grain. 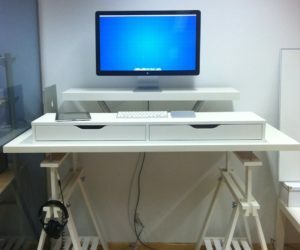 Presented by Hostler-Burrows of New York, the collection includes desks and benches. 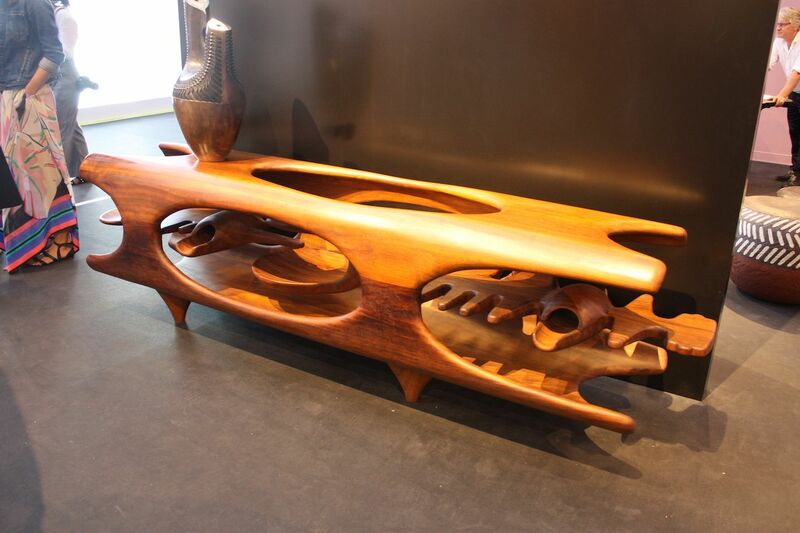 have been critically acclaimed fixtures in the international art and design world since the 1987 Whitney Biennial. They recently saw a spike in attention in New York for their transformation of the Metropolitan Museum’s rooftop into “Big Bambu” in 2010, which is among the museum’s top 10 visited exhibitions. 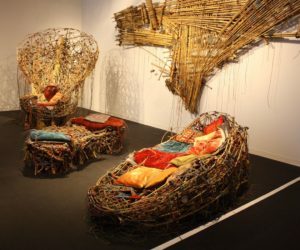 This year, the duo took on furniture, transferring the same concept of bamboo poles connected with colorful cords like those that rock climbers use. 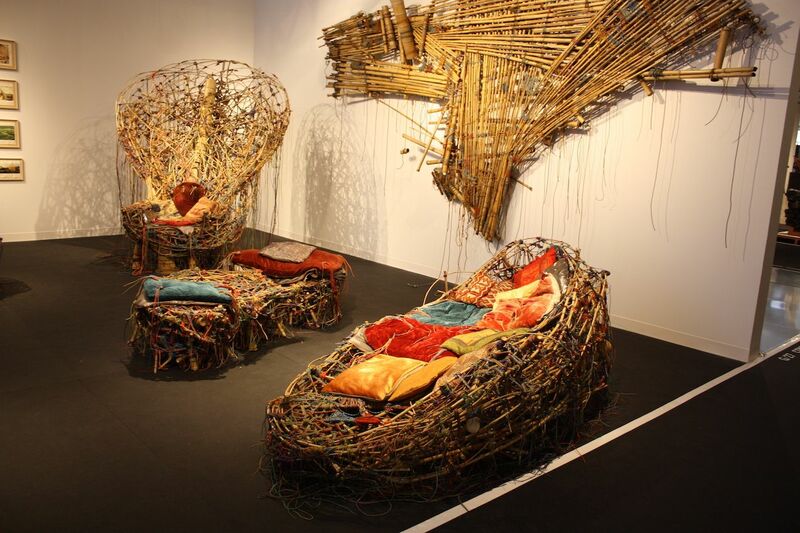 The result is this collection of pieces presented by the Cristina Grajales Gallery. They all sport delightful names like the lounge called “So Swishy in Her Satin and Tat,” the “any Day Now” bench and the “All the Nightmares Came Today” chair. 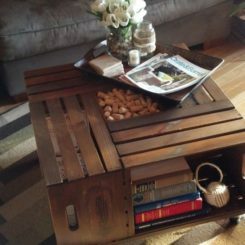 Admittedly, we’re fans of and found a couple of pieces we just had to highlight this year, including this table by . 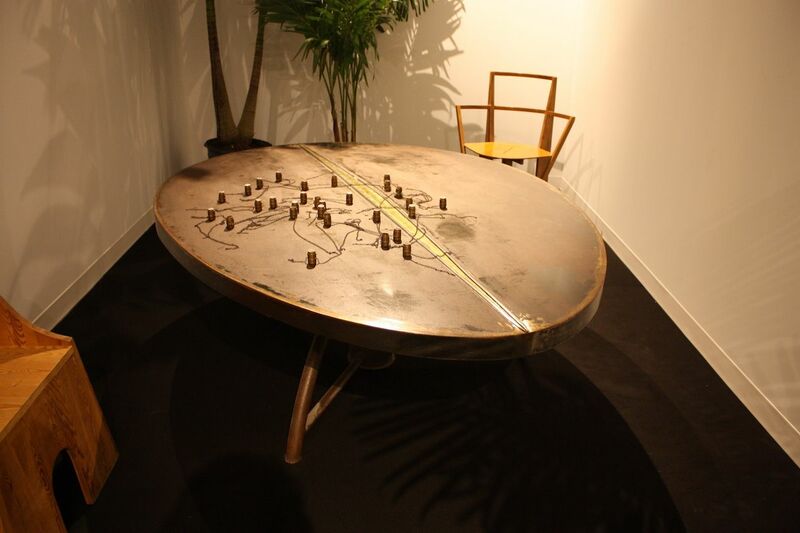 The artist’s furnishings — predominantly tables — fuse mixed materials like cement, pigments, wood and metals into one-of-a-kind pieces like this one. Scattered across the top are individual candle holders, attached to chains, which can be groups and arranged however you like, for a different look at any time. 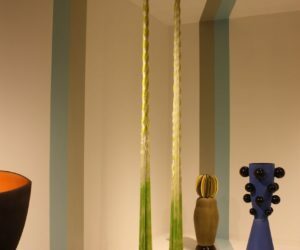 The gallery focuses on unique objects, prototypes, and limited editions from both historical masters and contemporary designers. 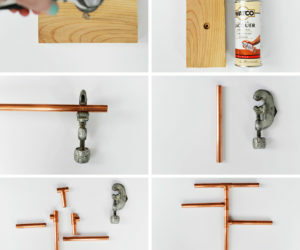 The small, loose candle holders add more of an industrial look to the table. 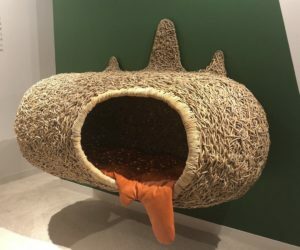 The late Urano Palma, an Italian designer, created this Casanova chair — along with the baby version — using a very unusual technique. 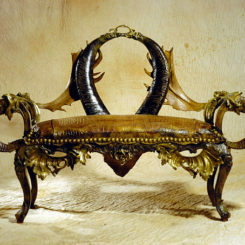 To achieve the texture of the wood, he drilled holes and inserted woodworms to create the holes that pepper the pieces. (The worms are then removed using a steam process, so no worries.) 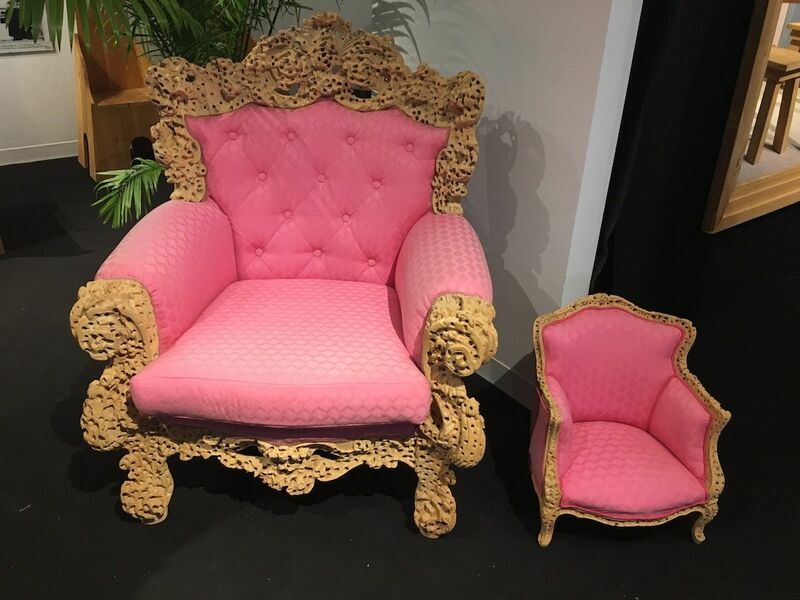 The baroque style chair was a bit ahead of its time, being upholstered in this marvelous pink fabric which is now really trendy. 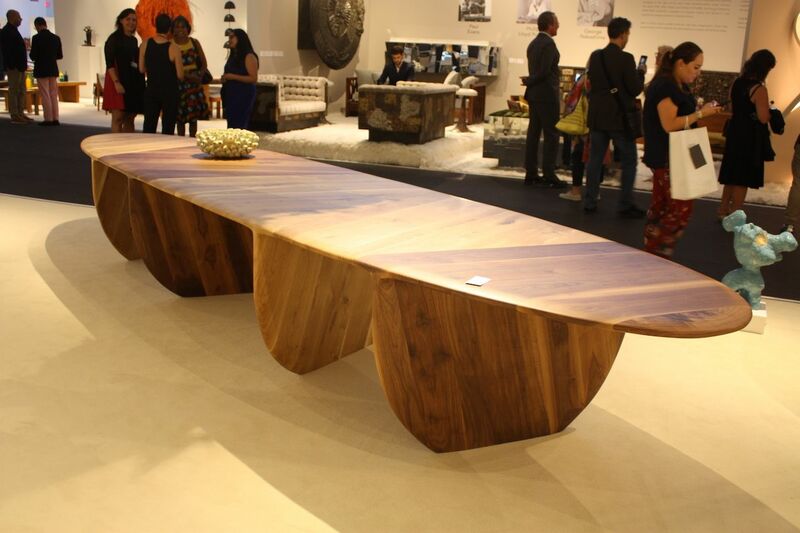 The combination of a recognizable, formal shape with the quirky wood is really unusual. 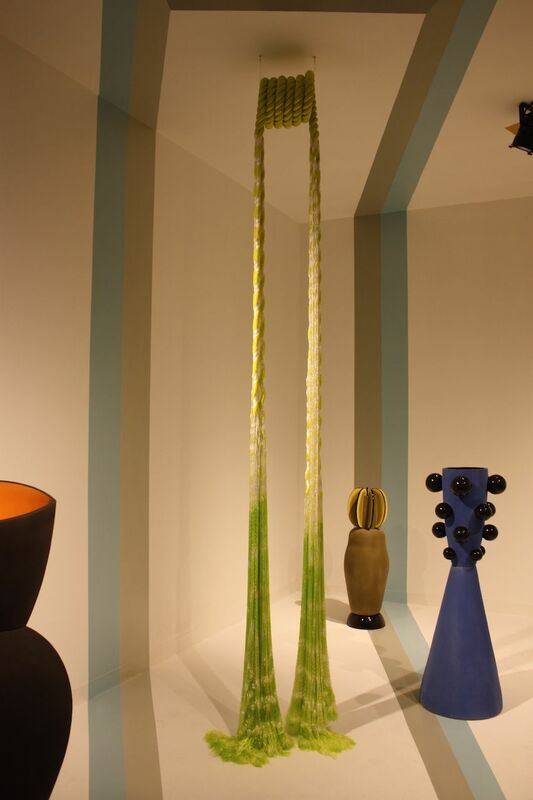 Palma’s career was mainly spent on installations until 1960, when he turned to design. 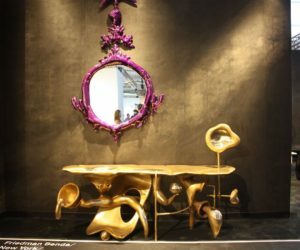 Usually, we make a beeline for Friedman Benda’s booth to see new Campagna Brothers designs, but this time we were more interested in Misha Kahn and the distinctive works he has recently made. 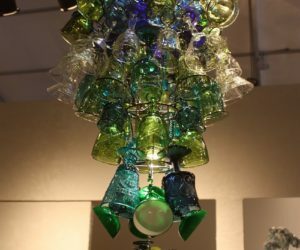 He literally takes one man’s trash and turns it into treasures, and also pieces that use cast bronze, metals and blown glass. 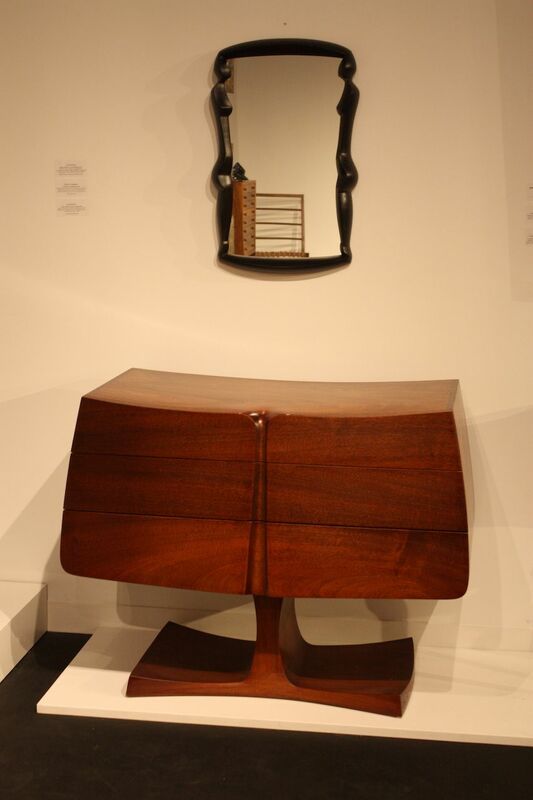 This setting includes a mirror by Kahn. While the piece looks like an inflatable, most often they are made from bronze and colored using automotive paint. 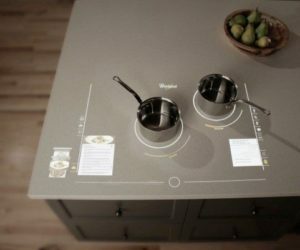 The console really makes you think of Dr. Seuss or Willy Wonka, with its multi-component base and lack of traditional legs. 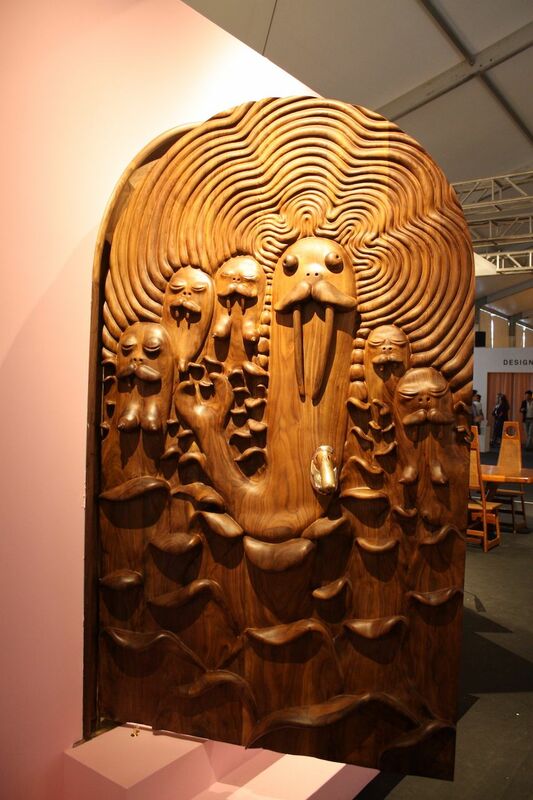 Wild and wonderful, works by the Haas Brothers are always a draw and the crowds couldn’t get enough of this amazing carved door. 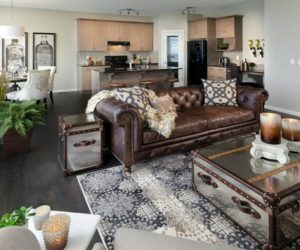 Called “,” the black walnut piece took more than a year to make, from the hand-sculpted clay models to the final carving. 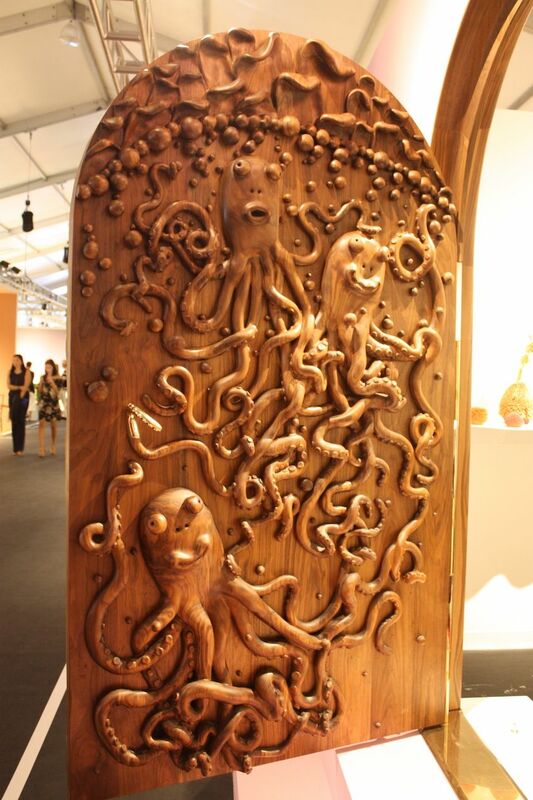 Inspired by “I Am the Walrus” and “Octopus’s Garden” by the Beatles, the door is a massive sculptural delight. 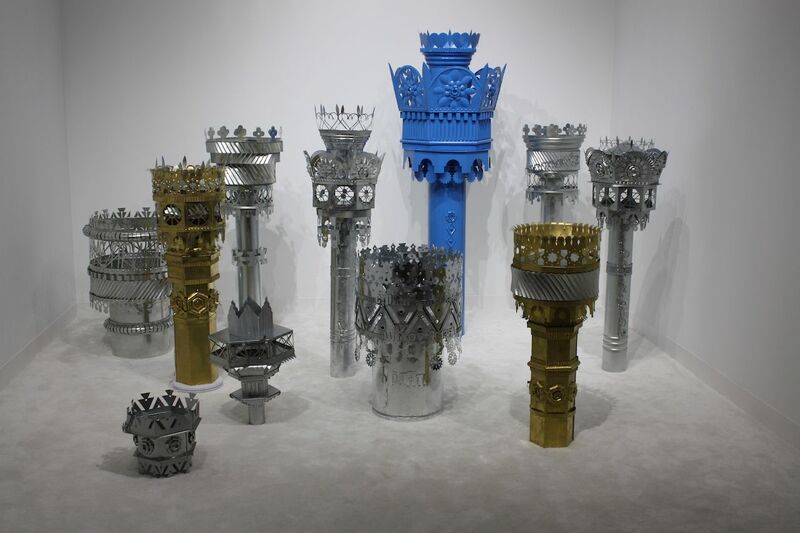 The LA-based artists are known for their fantastical works. 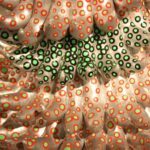 The interior side of the door is a tangle of octopus legs and profusion of bubbles. 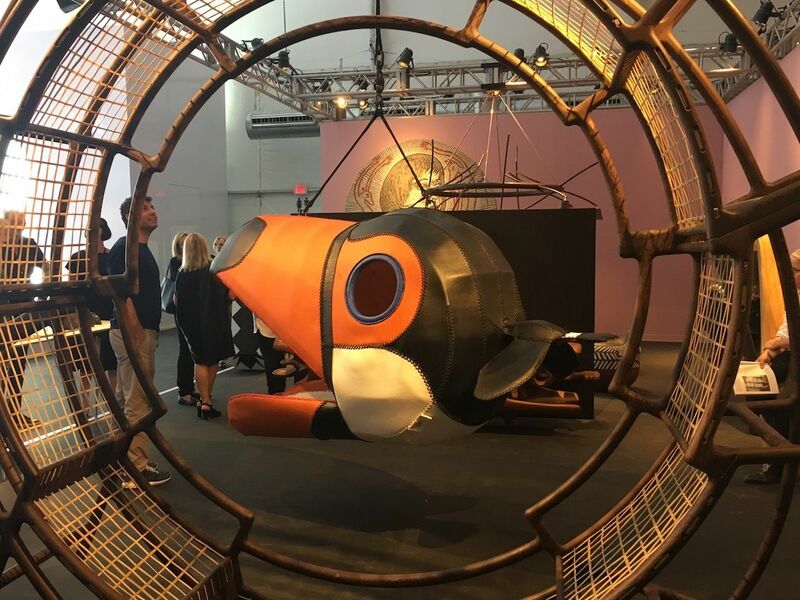 One of Design Miami’s unique features is the Design Curio, which present “cabinets of curiosity” sprinkled among the fair booths. 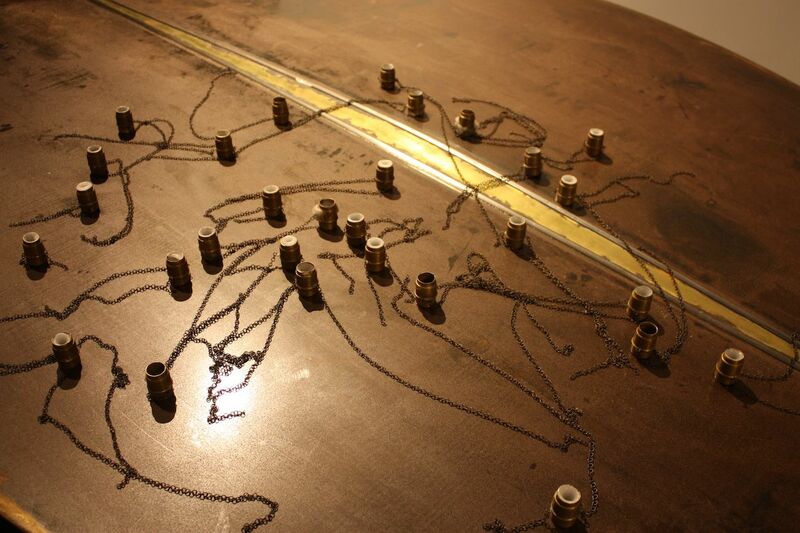 Each Curio features an environment that focuses on objects, textures, artifacts or ideas. This curio called “Stavropol,” by 33-year-old Russian architect and furniture designer Harry Nuriev, was a great example of why called him “The Man Designing Spaces for the Instagram Age.” The arrangement of floor lamps is very photogenic but not overwrought or painfully contrived. 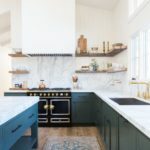 The intricate pillars of galvanized metal — with a pop of color — are said to be inspired by the izba, a traditional log house typical of Russian farmsteads. They were created by a team of Russian tinsmiths and artisanal metalworkers and feature the craft traditions of his youth in the countryside of the Russian Caucasus. Nuriev is the founder of Crosby Studios in New York City. A cascading chandelier might not be anything new, but this one from the is. 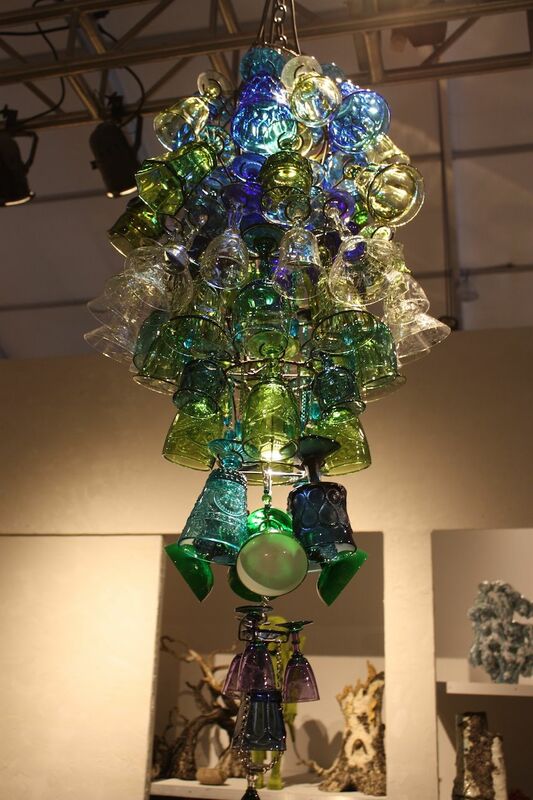 The light emotes from within clusters of colored glass goblets of all styles and a variety of profiles. 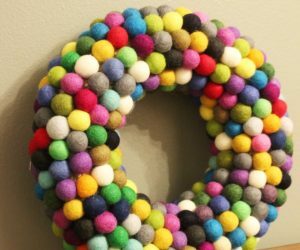 The ombre color arrangement also sets this one apart. The fixture is a definite statement piece and would be an artful addition to a kitchen or dining area. 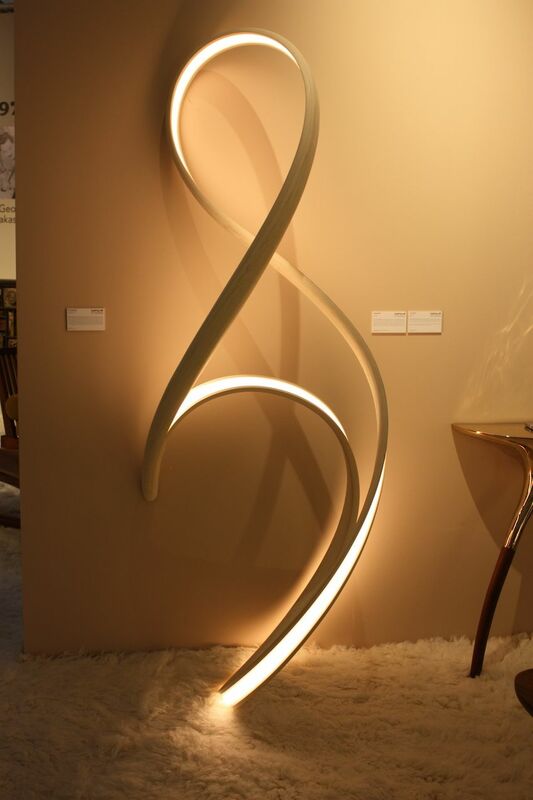 The sinuous curves of this lamp by make for a graceful ribbon of light that looks like it comes out of the wall. The Standing Freeform II is part of a series that explores undulating shapes. Procario’s works are made of micro-laminated, cold-pressed bent wood. He considers potential designs by experimenting with twisted paper models, but instead of trying to make the wood conform to a specific, pre-determined shape, he allows it to do its own thing. 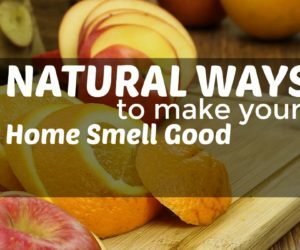 This results in more organic and natural flowing shapes. His work was presented by the Todd Merrill Studio. Procario is known for pushing wood to the limit with regard to the stress in the shapes. 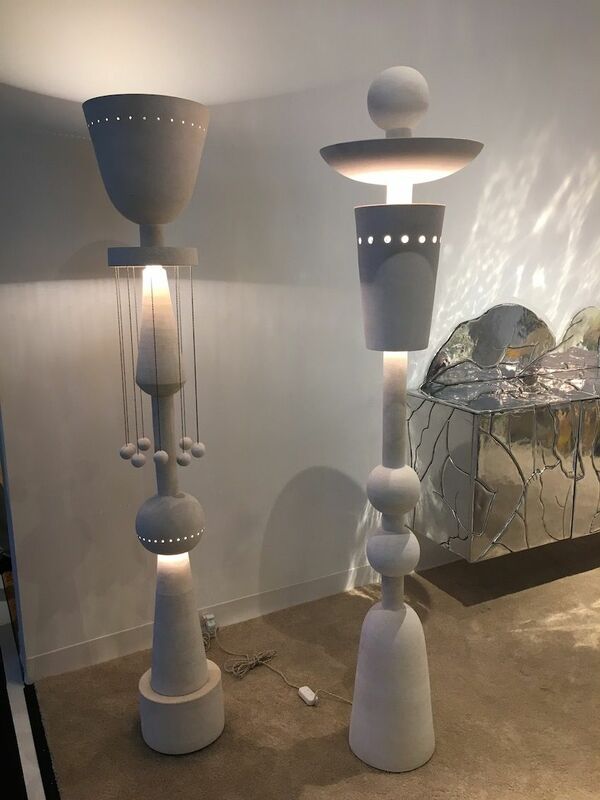 The Future Perfect presented another great curated collection of works this year, including these marvelous floor lamps by . Decidedly modern, the white totem-style ceramic pieces incorporate global references and are said to evoke Bauhaus designer Oskar Schlemmer’s silhouettes. We love the collection of shapes, dangles and the amazing amount of depth that is created from the light in these monochrome pieces. Roinestad’s ER Studio creates sculptural objects, accessories, furniture and lighting. 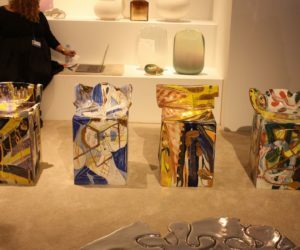 Another wonderful selection in The Future Perfect exhibit was this set of four one-of-a-kind ceramic stools. 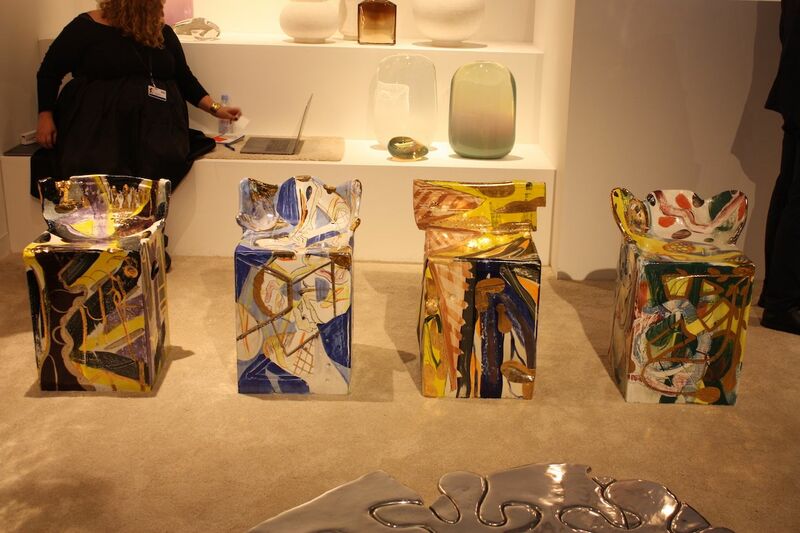 Created by , the metallic square ceramic chairs are freeform and the result of the artist’s fancy. The colorful hues are lively and the varied style of chair backs is fun. The Venezuelan-born artist is based in New York City, producing works that are included in private and museum collections. 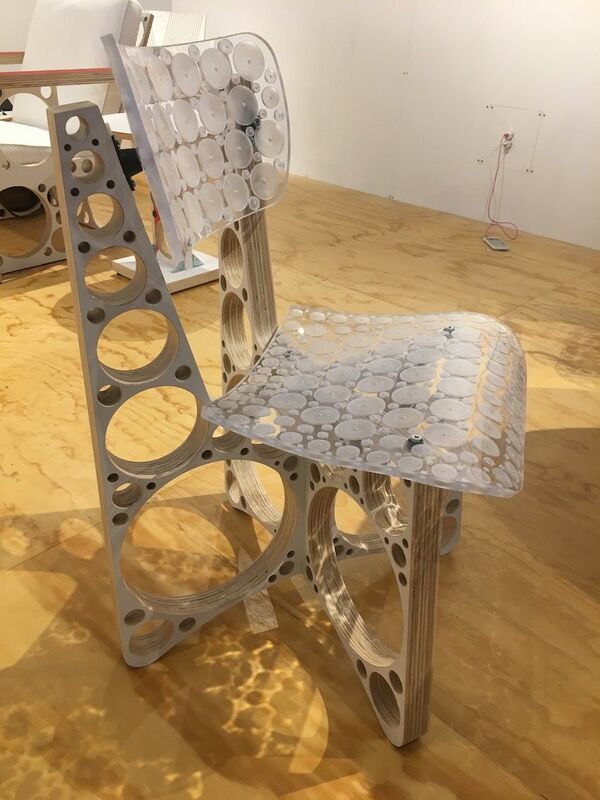 A super-futuristic chair design by sculptor Tom Sachs — The X Chair — was presented in a Design Curio from Salon 94 Design. “Tom Sachs: Furniture” featured the artist’s series of plywood and Lexan furniture that was milled using robots and a CNC machine. Sachs, who has been creating one-of-a-kind pieces for at least three decades, assembled and hand-finished the chairs in his studio. Sachs is probably best known for making elaborate recreations of modern icons, like the time he created Knoll office furniture out of only phone books and duct tape. The shadows cast by the holes in the frame are an artful feature all their own. 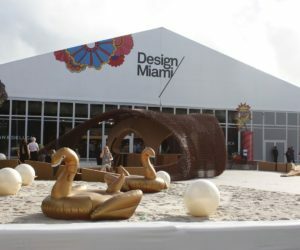 Since 2012, has presented pieces from its Objets Nomades collection at Design Miami. 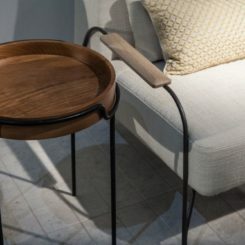 Objets Nomades is a collection of limited-edition, collectible furniture inspired the company’s Art of Travel campaign. 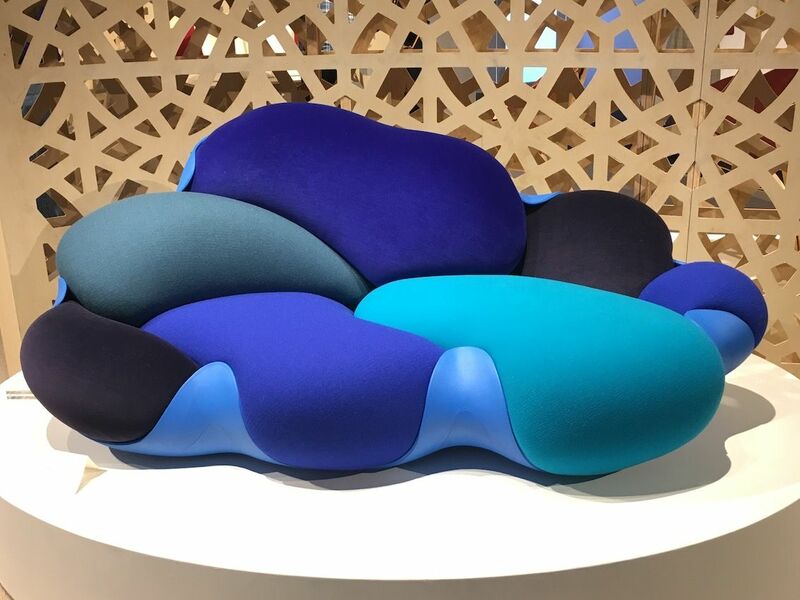 This year, the standout star was a turquoise and blue-hued edition of the Bomboca sofa designed by Brazil’s design powerhouse — the Campagna Brothers. Named after the Brazilian sweets served at weddings and children’s parties (the word means “very good”) the modular sofa was inspired by clouds. The eight removable cushions put together like a puzzle in a leather-covered shell. Irregular shapes, bright colors and mixed materials create a pure fantasy. presentation the Isolation Sphere spurred some discussion amongst visitors, given today’s rampant isolation by electronic device. Designed by French architect Maurice-Claude Vidli’s in 1971, it was meant to be an escape from the world at large. 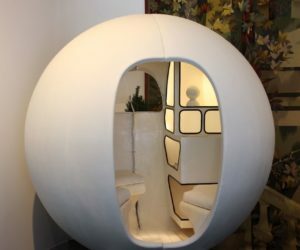 The round room minimizes sound with the use of four polyester shells and includes electrical power and a radio. In its day, it was a groundbreaking work highlighting plastics and futurism. Today, this could be a tool for social discourse on the topic of isolation. Clearly, we no longer need a sphere and an outlet to isolate ourselves from the world. Vidli was clearly ahead of his time, we would say! This special piece is a rare David Ebner low chest of drawers from 1982 that was presented by . 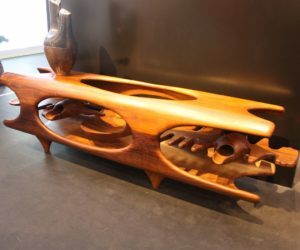 Ebner is a master woodworker who creates “antiques of the future. 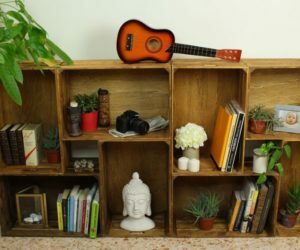 The shape, wood and elegant design are spectacular. It is a prime example of works in the Studio Craft movement and Ebner is an icon of the genre. 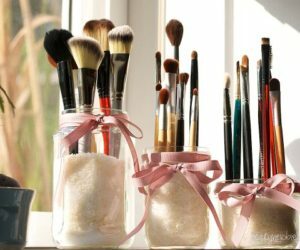 The Studio Craft Movement rejects mass production and all its associated characteristics. Another Design Curio that caught our eye was this one by Norwegian crafts and , featuring two female artists, textile artist Ellen Grieg and ceramic artist Elisabeth von Krogh. Grieg, who previously work on tapestry for many years, has recently shifted her works to the abstract. Creatively dyed nylon rope in vivid colors spiral down from the ceiling, unraveling near the end in a pool on the ground. Alongside are works by , who is known for her large-scale ceramic pieces that have evolved over time from purely vessels to sculpture. The colors and geometric elements are striking and optically intriguing. 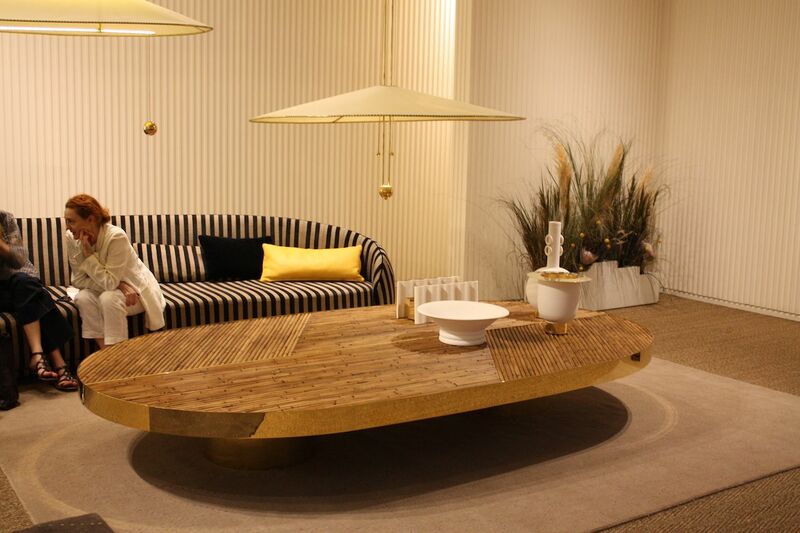 It wouldn’t be Design Miami without the latest creation from South African designer . This year it is Toco Toucan, inspired by the many bowls of Fruit Loops he ate as a child, and the brand’s mascot. 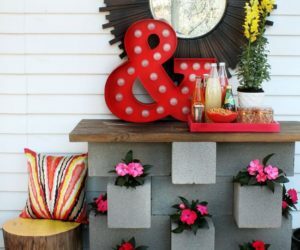 Like all the other hanging seats Hefer creates, this one is fun and playful. You can’t help but smile and chuckle when you see — or sit in — his whimsical creations. Never is represented by The Southern Guild gallery. 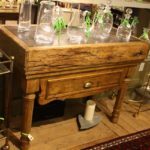 Southern Guild also presented a stunning carved console table is called “Beauty is in the Beast II” by John Vogel. 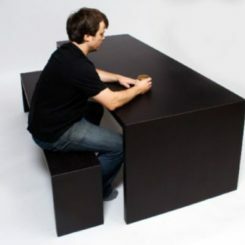 The table is made from Iroko. Vogel strives to create pieces that connect of people to nature through simple and imaginative designs. The interior section of the console adds complexity too the design and an artful element that is thought-provoking. of Chicago presented this Lounge Chair by Ron Krueck and Mark Sexton. 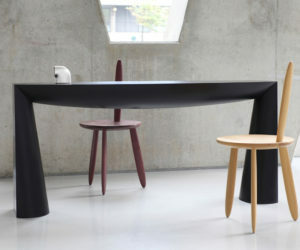 The duo has worked together for more than three decades, however this is the first time the chair was presented as a finished piece, even though it was designed in the 1980s. Displayed on a mirrored floor, it’s possible to see the complex and beautiful structure on the underside, which is just as dynamic as the front of the seat. 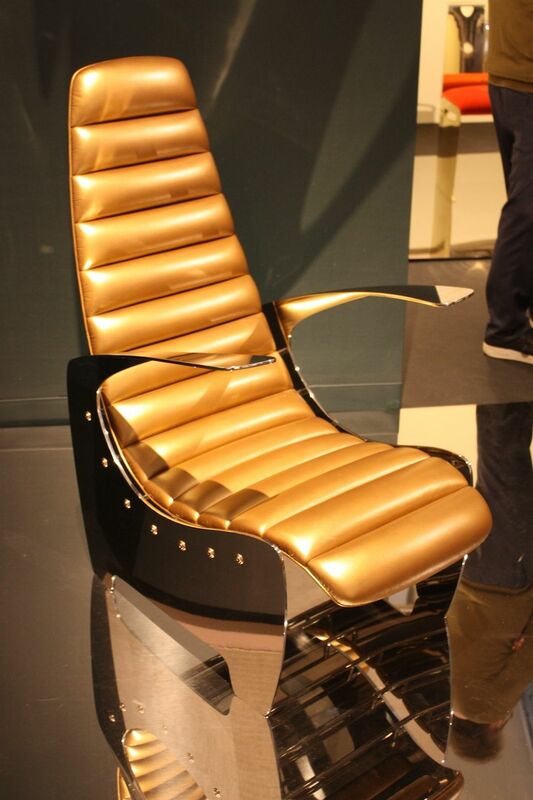 Every element of this chair glimmers, from the highly polished metallic leather to the frame and rivets. 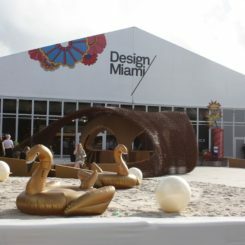 As always, design Miami had more fun pieces that we can show you here. It’s one of the shows we always enjoy the most thanks to its ground-breaking new designs along with those from established designers. And, we have to say that we enjoyed the Design Curios more than ever before because they were so creative. 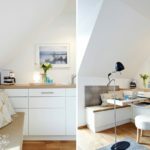 We hope you find inspiration in these designs too.